Well I should start by telling you about the bird walk I went on with the Natural History Society, my first outing as a member. It was in the park right by my house, Jericho Park, which is the second biggest park in Vancouver, next to Stanley Park. 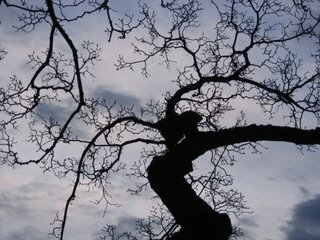 It seriously must have been God’s providence to bring me to this area, because this park is the mecca of bird watching. It has more habitats (meadow, forest, beach, swamp, pond) than Stanley Park, so a greater variety of birds use it. So yesterday morning I joined five older women, united in their love of birds (and in their hatred of dog owners who let their animals off the leash and scare all the birds away). I think they were excited to have me because they think I am the key to attracting younger eople to the 90-year old Society. We'll see about that. Anyway, I learned so much from our guide, Daphne – I asked her all the bird questions I’d built up over the last seven months. You'd think these bird people would be frumpy, but this septogenarian was seriously decked out in all the latest and greatest MEC gear, with way bigger binoculars than mine. Birding is serious business, you know. Some dedicated birders have "life lists" of all the bird species in the world and check off birds when they see them, and travel to highly remote places on earth to get the rarest ones and join the 700 or 800 club. This could be me in a few years, folks. Tremble. 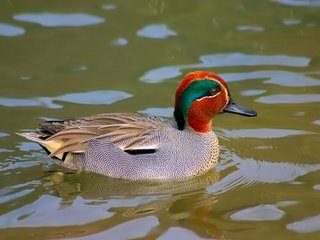 Yesterday, I saw six birds I’d never seen before, including the smallest woodpecker (downy woodpecker) and a duck called a green-winged teal. Here’s a picture of one, because I know you’re all wondering what they look like. Isn't he great? I also saw Saskatoon berry bushes! A little bit of home. Mostly, it was so great to have my passion shared with others, to have people not think I'm crazy, even if those people are women in their 60s and 70s. Now I must tell you about this morning… Isn’t there some sort of unwritten rule that it must be sunny on Easter Sunday, at least for the duration of the morning service? I mean, rain on Good Friday is ok, it’s probably even helpful and appropriate. And let’s face it, Easter Saturday doesn’t really have any rules. But on Sunday, God must provide sun for the entire earth, don’t you think? It’s just part of His job. He broke the rules in Vancouver. 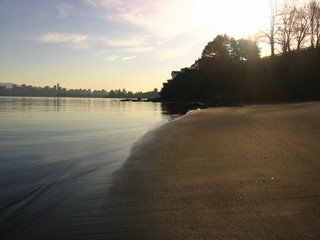 I left my house before seven for the Kits Church sunrise service down at the beach (Hey – do I have any readers who have been at Emmanuel long enough to remember when we used to do Easter Sunrise services down at the river? I still have blustery memories of that.) Anyway – sunrise service. Nope, no sunrise. It was hailing. Hailing! Argh. At least it softened into light rain as a group of about 50 of us huddled on the shore, singing songs a capella, guessing at the key and ending up singing way too high! It was pretty cool to see this guy James’ baptism. That’s real commitment to Christ, when you’re willing to risk hypothermia to be baptized. My favorite part was when a raindrop landed in my cup and splashed me with communion grape juice. The service began in darkness, with black sheets over all the windows, reminding us of our theme of lament that we’ve been studying over Lent. We were singing a song that I didn’t know and had not practiced, called “Who will roll the stone away”. We got to a part that went, “He is risen from the dead!” and I guess the children had all been briefed at a meeting I didn’t attend, because they let loose, ripping the black curtains down, turning on lights and spotlights, and they all had obnoxious noisemakers and party blowers and they were throwing confetti everywhere and dancing around the church. It was one of the most amazing Easter outbursts of joy I’ve ever experienced! All I could do was play the piano with all my might, which I did. Over and over again, we sang “He is risen from the dead,” as the adults joined the kids in the aisles, bringing daffodils up to the cross. Pure, authentic, chaotic joy. Wow. A great Easter morning, all in all. I just realized it’s kind of my baptism birthday today. I was baptized on Easter Sunday in 1997. Happy 9th baptism birthday to me! To my brother, Daniel: did you get your baptism ring yet? Chris told me that you and Bailey were going ring shopping. Almost gave me a heart attack. Ha. So Happy Easter to you all, keep praying for me. I finished my paper but it somehow turned out to be 4000 words instead of 3000, so I have some serious editing to do. And I have three exams. But it will soon be over!